Last Spring, I had the opportunity to teach a "special topics" course. I use that as shorthand for "Dave wants to learn about X, so I'll inflict my learning process upon some willing victims and collaborators called students." I roped in Michael Kaminsky to co-teach a course on "memory and resource efficient big data computing," which we pretty much defined as we went along. In fact, one of the first assignments for the students was to help come up with topics to discuss. CMU students are an awesome resource that way. #1 is fun, and at the end of looking at the papers in this area, we decided that there was room for improvement by people who pay too much attention to CPU instructions and the memory hierarchy - namely, us. If it hasn't become clear from the stuff we've been working on lately, the algorithm engineering process is a ton of fun sometimes. :) This blog post is primarily about the context for and some of the work we published in our forthcoming SEA 2013 paper, led by Ph.D. student Dong Zhou, "Space-Efficient, High-Performance Rank & Select Structures on Uncompressed Bit Sequences". The technical definition is "one that takes close to the information theoretic lower-bound for the structure." And if you're really being precise, if Z is that lower bound, a succinct structure takes Z + o(Z) size to represent. Remember that that little-oh means that it asymptotically takes only Z bits. But even those space-hogging "compact" data structures that take O(Z) bits are pretty fun to play with, despite possibly taking several times the information-theoretic lower bound. 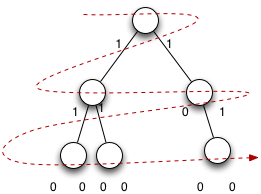 Probably not an unfamiliar way to represent a binary tree. To decode that, for every "1" interpret it as meaning "there is a child", and for 0, meaning, "there is no child". Each node is represented by two bits. We represent them in "level order" - write down the nodes in the first level (the root), and then the nodes in the second level, and so on. That representation takes 12 bits. Our previous one took 768 bits. Not bad, not bad. But, you say, I can't navigate this tree! Right you are. 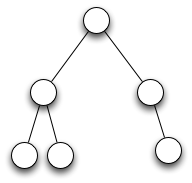 This is an implicit representation of the binary tree: It takes exactly Z bits to represent it, plus perhaps a few more to indicate the start or whatever other conventions you're using. But it's not random access. But we can make it so, with a little work. The implicit representation wasn't the genius of Jacobson's thesis: The navigation was. #2 is less obvious. Consider the figure above. The left child of the root is the second real node in the tree. (i=1, using zero-based indexing). Therefore, its left child bit should be stored at position 2*i=2. And, indeed, there it is: The root has positions 0,1 and this guy is at positions 2,3. The key here is that we're indexing based upon knowing which real node we're discussing: The ith real node has (i-1) previous nodes before it, each of which needs two bits. So the key question is: Given a node in the tree, which real node is it? There might, after all, be gaps. The answer is: If we knew how many "1"s appeared before it in the bitwise representation, we know which real node it is. This operation is called rank(x): Given a 0/1 bitvector, calculate how many 1s appear to the left of position x. It has a corresponding function called select(y): Calculate the position at which the y-th 1 appears. To go up the tree to the parent, you know that it is represented by the position/2-th real node in the tree. In other words, select(position/2). Two memory fetches in parallel, a popcount, and an addition. But that space doubling... ew. When we taught the previous approaches to rank & select, it started dawning on us that there was some room for improvement, not from the theory side, but by applying some systems tricks. In particular, the above popcount trick, and also taking the cache hierarchy into account. We submitted our first version of the paper to ALENEX'13, and it turned out that someone beat us to popcount by a few months (oops), but the cache stuff still proved useful. Our SEA 2013 paper describes a "recipe" for playing this game. Step 1: Figure out the biggest "basic block" possible. The basic block is the size at which you just invoke popcount in a loop. 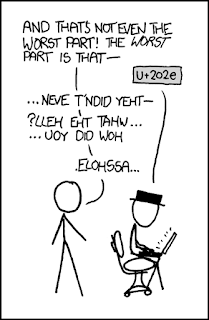 Skipping to the punchline, the answer is: One cacheline (64 bytes, or 512 bits). Larger than this, you start wasting memory bandwidth. But smaller than this and you don't gain much speed. Sum up the 0, 1, 2, or 3 L2 entries to get to the basic block you want. In the end, it's fast. It's not quite as fast as directly indexing to 64 bits, but it uses only 64 bits of index overhead for 2048 bits, or about 3.125% overhead. The resulting structure is nearly as fast as the previously-published fastest rank structures, and uses less memory than they do. It uses as little memory as the previously-published most memory efficient structures, but is much faster. In the SEA paper, we also show how this structure works very nicely within a previous approach for select and simply makes it faster. 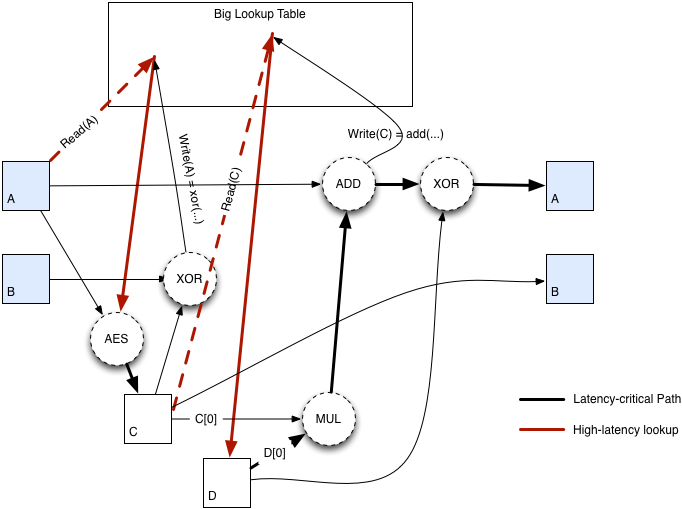 Paying attention to the cache hierarchy can provide a big win for algorithm engineering. There are opportunities for systems-thinkers to contribute to the state of the art in algorithm engineering. Next up, someone should ask about the joys of encoding monotone integer sequences. The tricks (not ours, existing ones) are gorgeously fun.